By the time we left the King of Chicken, we were getting pretty full, but we were determined to try one more place. It was a scorching summer day, and so it was with great relief that we entered La Barca Birreria's cool air-conditiioned interior. A set of booths line one wall, and a large take-out counter along the other side. We grabbed a booth. A small TV was playing a movie in the corner. Going by the menu board, they appear to do a lot of carry out dinners. With a name like La Barca Birreria, we had to try the goat. I also ordered an Al Pastor for comparison. Unfortunately, we thought the goat was a bit bland. Though, to be fair, we had just eaten the very spice-ly flavor chicken tacos from Armando's, so that may have affected out taste buds. Also, I've never had a goat taco before, so I don't have anything to compare it to. I did like the Al Pastor. The pork bits were nicely charred. I'd rank it as my 2nd favorite Al Pastor of the day, after the taco truck. (Joe might disagree.) Though this was our least favorite stop of the day, it takes a lot for me not to give a place a 2nd try. And just because a place advertises itself as specializing in goat, doesn't mean that goat tacos are the best way to sample their speciality. So if anyone else has tried La Barca Birreria, we'd love to hear from you. We finished off with a bit of corn cake for dessert. Simple, nicely moist and not too sweet. La Barca Birreria y Taqueria is located on Vernor Hwy, in Detroit's Mexicantown. Joe spotted these guys grilling outside along Vernor Hwy, and said "we've got to check this out." It turns out that they were grilling chicken, and selling it by the half or whole chicken. Since eating half a chicken would have (a) been a departure from our taco theme, and (b) taken us out of the game for the rest of the day, we took the griller's advice and went into the attached restaurant for some tacos de pollo made with the pollo they were cooking on the grill. Huge, gorgeous, loaded with juicy red-sauced hunks of that grilled chicken, and so hot we couldn't even pick them up at first. The salsa was great too — spicy and way better than the table salsa they gave us — but the chicken! The chicken was the real star. Moist, flavorful, not as spicy as it looks by a long shot (some of that red color is achiote, not chilies). We also had a chorizo taco: equally huge, with a lot of spicy chorizo, and the same sauce. While we were eating it, the guy on the grill (who may well have been Armando himself) leaned through the sliding window beside our table and asked what we thought. When Joe told him (in Spanish) how good it was, he passed us some chicken pieces straight from the grill as a free sample. Heaven! Highly, highly recommended. We'd also recommend you park your car where the grill guys (or you) can keep an eye on it, because there were some folks hanging out in the area drinking. Armando, the king of chicken, is out there grilling most (all?) of the year. Just drive along Vernor Hwy and look his roadside tents between Lansing and Ferdinand St. in the Mexican Town. "Hey, I've always wanted to check out that truck!" One U-turn later, and we were parked across the street from Tacos El Primo. The menu is painted on the board. You give your order to one of the cooks through a small window, and minutes later they pass back tacos hot off the grill. It was a bright hot summer day, and they must have been roasting inside their silver taco cart, but they sure were enthusiastic as they handed us our tacos. We all ordered tacos al pastor, and they were huge! and utterly amazing. My favorite al pastor of the day, even if not the traditional trompo-style. They have a small table set up with traditional garnishes of radishes, roasted jalapeños and quartered limes. They offered me a small seared onion and told Joe in Spanish that I should squeeze lime juice over it. Oh my! That was delicious! Across the street a church ceremony of some sort (a wedding? we weren't 100% certain) was just ending, and the guys in their suits and ties started trickling across to load up on tacos. This is clearly a locals' hangout, and it definitely helps to know a bit of Spanish, but if you don't speak any Spanish beyond "al pastor," don't let that stop you from trying their tacos. The Tacos El Primo truck is located on a small parking lot on Junction St and just across the street from a large church, visible from Vernor if you are heading toward downtown. I don't know if the truck moves or if this is its permanent location, but look for them. They are worth checking out! Ah, yes, it's the Taqueria Tour of 2008. Most local Ann Arborites who have been to Detroit Mexican Town are familiar with what I think of as the "tourista" area on Bagely street, where you can find a mix of restaurants serving up Americanized fare with big margaritas and a few authentic places tucked inbetween, such as Taqueria Lupita, one of our favorite Mexican restaurants. But Mexican Town is far larger than just the short stretch on Bagley street, and it was time to branch out and try the other places we've seen up and down Vernor Hwy. Our first stop was Taqueria Arandas, located at what I think of as the far end of Mexican Town, at the intersection of Vernor and Livernois. We walked inside the door and after making our way past the grill, where the al pastor was on its spit, and were stunned to find a very very large sit down restaurant. (This place is bigger on the inside than it looks on the outside.) Arandas is a full service restaurant with an extensive menu. If you need to seat a large group, this is the place to go. We were sticking with tacos, but the rest of the menu is definitely worth checking out. They have a variety of dinner plates and Mexican soups. Here's our rundown on the tacos we tried. al pastor — quite nice, and made using a real trompo (the spit that you stack meat on and grill it). Joe like this version of pastor more than I did, but we both agree it's good. chorizo & egg — a bit bland to our tastes. I doused mine with salsa. Que Huong, Madison Heights — the best $2.50 lunch around! 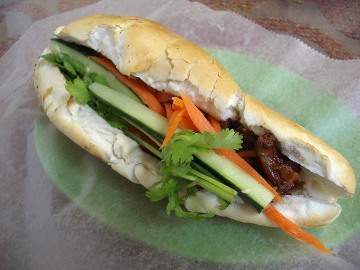 Que Huong is a small family run "hole in the wall" featuring great Vietnamese food at really low prices. The bulletin board just inside the door is covered in announcements written in Vietnamese, surely a good sign. The dinning room is clean and spare, and a TV plays a Vietnamese travel program in the background. For a shocking $2.50 you can get a delicious banh mi tay ("French bread") sandwich with Vietnamese prepared meats stuffed in a French-style baguette with julienned vegetables: a relic of colonialism. Fusion food, but good fusion food. One of these sandwiches is enough for me for lunch. Big appetites might want to order two, or get cold rolls to go along with it (the fried spring rolls were okay, but the cold rolls with shrimp and pork were better). 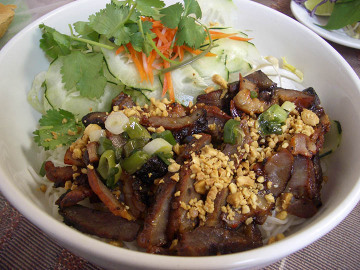 Or... if sandwiches aren't your thing, for just a bit more you can enjoy a large bowl of rice noodles with that same tasty grilled pork topped with chopped peanuts. Mmmmm... Note that in both cases, they're using barbecued pork, which is unusual for Vietnamese restaurants in our limited experience, but tasty. We spent the weekend in Troy, so Que Huong was only a few short miles away. Between us both, we visited five times, trying a good range of the menu. I bought take-out pho. Delicious! And they put it in a wide styrofoam container that works reasonably well as a soup bowl if you are without one. (I tore off small bunches of noodles and dropped them in the broth, adding more when there was room.) They give a generous bunch of basil, even in the winter when basil is so much harder to find around here! Joe gave their bun bo hue a try: rice vermicelli soup with beef, Hue-style. (Picture in the extended post.) It has a different flavor from pho; sweeter and spicy, even before adding hot sauce or hoisin. In the mood for something different, Joe and I headed to Detroit one day to spend the morning at the Eastern Market. You can easily spend a happy day wandering through this sprawling market of some five sheds plus the surrounding blocks of produce distributors, meat packers, spice, nut stores and still not see it all. After spending several hours, we retired to the Louisiana Creole to enjoy some of the best New Orleans style food you'll find up here in Detroit. We had to ask for directions. (Take time to print out the map from the Eastern Market website, and you'll save yourself a lot of effort.) 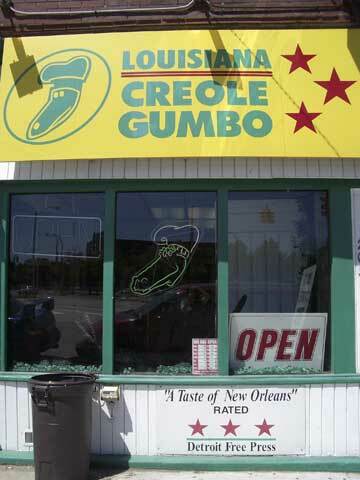 When we told the woman we wanted to find Louisiana Creole, she gave us a knowing nod of approval. It's a bit of a walk from the market, but manageable. You can also drive it. There is free street parking — as long as you don't park too close to the fire hydrants. This bare-bones restaurant primarily offers everything as carryout, with two fast-food style tables for those out-of-towners like us who have no place to carry it out to. One wall holds the numerous restaurant reviews and awards Louisiana Creole has gathered during their 30+ years. I told the woman ahead of us that it was our first time here. "Oh, you're in for a treat," she said. When I asked her what was her favorite dish, she paused for a moment then said the red beans and rice, warning me that they came a bit sweet. And the cornbread. Make sure to get some cornbread.